Traveling has not always been a big deal but for the past two centuries it has become fashionable to travel. In the early Middle Ages it was difficult to get a lot of places. The old Roman road system had collapsed under the weight of “barbarian” invasions and it was only in the High Middle Ages that they began to be restored, making traveling easier. This coincided with, and is partially attributable to, the rise of a profit economy and the use of money. Once you did not need to carry things with you but could buy them with coins along the way then it was possible to go further and further away from home. Because of this roads were recovered and rebuilt, fairs began to appear at significant crossroads and large-scale migration became possible. By the twentieth century, especially for the English and for folks from the United States, it became commonplace to make a grand tour of the European continent. It was a sign of culture, high society and intelligence. A lot of good literature grew out of this: Nathaniel Hawthorne’s Marble Fawn, Henry James’ Daisy Miller and The Portrait of a Lady, just to name a few. Fast forward to 2013. I’ve been assigned to grade the argumentative speeches of seniors in the Torrey Honors Institute at Biola University. One student, who had spent a semester abroad in London, chose to argue that there is great value to traveling so you should make a point of doing it. I agree. In the past ten years I have gone to Europe sixteen times with students visiting many places, from Russia to Turkey to Italy to England and many points in between. Nine of those study-abroad trips have been to the same place – Rome. This year I brought more students than ever with me to Rome – 32. That’s a lot of people walking down already crowded sidewalks, visiting already busy churches and museums. Because the trip occurs in January, however, it really isn’t all that bad. There are few lines in Rome in January, making it an ideal time to visit the city. This year I have had the good fortune of staying in Rome for a couple of extra weeks, without any students. A monk friend of mine introduced me to one of his confreres who is currently living and studying in Rome. This weekend we decided to visit the ancient Cistercian monastery of Fossanova. 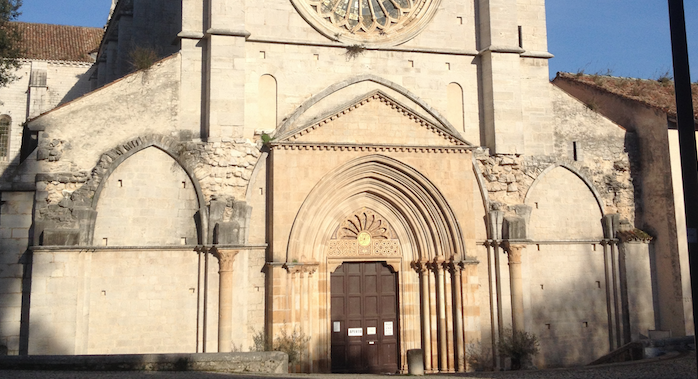 The Cistercians arrived here in the early twelfth century and quickly got busy building a beautiful church. Fortunately, the church remains today largely as it looked in the early thirteenth century. By the grace of God the Baroque style so prevalent in Rome couldn’t be bothered to make the 60 mile journey to Fossanova. Though the Cistercians left some time ago and the church has been home to Franciscans for nearly a century, Fossanova is quintessentially Cistercian. (Historically, however, it might be better known as the place where Thomas Aquinas died on his way to a church council in Lyons). On the train to the abbey from Rome, my Cistercian traveling companion asked, “Aren’t you tired of coming to Rome and seeing the same things year after year?” He’s not the first person to ask me that question in the past month. My answer is always the same, “No!” Because this year I am seeing the “same things” with different students, most of whom have never seen these things before. I still enjoy seeing the exquisite Bernini statues at the Borghese Museum but I almost enjoy seeing my students see the statues for the first time more. I love the look on my student’s faces as they walk into the Sistine Chapel or gawk at Caravaggio’s Matthew cycle at the church of San Luigi dei Francesi. Don’t get me wrong, I still love those things too but I love that others love them and that I took them there. Over the years I have developed a way of looking at and experiencing these amazing monuments of human creativity. First, don’t read too much about a thing before you experience it. Guide books get in the way. Similarly, if possible, visit these things without a tour guide. Tour guides are usually nice people that talk too much. They view art too simplistically because they need the painting or the sculpture or the architecture to fit into an itinerary. They are so busy telling you what to see that you fail to notice anything. Just plant yourself in front of Raphael’s School of Athens in the Vatican and look – look up, look down, look at the less famous parts of the painting and you will notice Raphael looking back at you. There is so much to see. Take a friend (or 32 students!) to talk with about what you’re seeing. Once you are too exhausted to keep looking and thinking, pull out the guidebook or read the info plaque. It might be helpful or not but at least you have already experienced the art first-hand and unadulterated. Second, if you can touch it, do it. If you have ever been to Athens then you have likely visited the Parthenon. And if you’re like me then you were disappointed. Turns out, that place is more metal scaffolding than marble. They do not want that tourist destination to fall so they’ve propped it up in such a way that it’s actually ugly. Moreover, they do not want you to touch it. I was there once after having been in Turkey for a couple of weeks. While in Turkey I had visited, with students, Ephesus, Istanbul and a host of other old places. And we had touched, climbed on and experienced those places in ways that felt transgressive; but never once did a Turkish authority tell us to stop or not to touch. I like the way Turkey views their ancient monuments. The Greeks, on the other hand, seem to think that if you touch the Parthenon that it will most likely fall down. Every tourist is a veritable Samson. A student was pointing at a marble column and her finger was a good three inches away from the marble when, to our surprise, a guard barked at us: “Do NOT touch.” It was laughable. The Parthenon aside, always make an effort to (legally) touch history. Do not, of course, touch Caravaggio’s Jerome, though it would be really easy to do so. Do, however, touch Bernini’s Triton fountain or the columns of an old Cistercian monastery. Touching history makes it more real than merely looking. Finally, do not rush. Culture’s artistic heritage is like a good wine or cheese, it needs to be savored and enjoyed, slowly and leisurely. I have done a good number of trips with students where we were at the mercy of a tour guide, Europe’s laws on how many hours a day a bus driver could be on the clock or an overly optimistic agenda. I have seen and experienced a lot of amazing stuff on these trips so I do not begrudge them at all. In the end, though, I still prefer to travel and to visit museums and such on my own terms. I have a high capacity for looking at and experiencing art and architecture, so much so that no tour guide can keep up with my snail’s pace. They want to run and I want to crawl. They want to explain and move on, I want to stare and wonder. I once spent two hours in the Sistine Chapel, a feat that cannot be accomplished in the summer but is perfectly do-able in the winter. It was a blissful two hours and I really only left because the museum was closing and I had students to meet on the other side of town. Plus, I knew that I would be back the following year. Twelve months later, as expected, I was there again except that time I stayed in the chapel for three hours. And one day I suspect that I might be able to say, “Well, I think I have seen everything in the Sistine Chapel.” But until then I plan on returning again and again – unrushed. If you can travel, do it. It does not need to be to Europe or Asia or anywhere very far away from your home for that matter. Having just read Annie Dillard’s Pilgrim at Tinker Creek I have a new appreciation for traveling to one’s front yard! But when you do go somewhere cool, take it all in slowly and, if you can, touch it. For only then have you truly traveled.